Barbara Streisand’s house in the hills, an image which survived legal efforts at suppression to give us ‘the Streisand effect’. Copyright (C) 2002 Kenneth & Gabrielle Adelman, California Coastal Records Project, http://www.californiacoastline.org. The past fortnight saw the first ripples of reaction to the European Court of Justice’s assertion of a citizen’s ‘right to be forgotten’ online. Following the court’s ruling, Google began the implementation of a process whereby individuals can petition for the removal of links in search results to pages deemed objectionable. Google, which argued vociferously against the court’s ruling, may have had mischief in mind when it emerged that of the first batch of result removals, many were links to articles from reputable news websites such as the Guardian, the Telegraph and the BBC. Picking on organisations with the biggest bully pulpits – in terms of online popularity and influence – might have been a retaliatory attempt to kick up as much sand as possible. Or these incidences may just be the visible tip of a much larger iceberg: Google is said to have brought in an “army of paralegals” to deal with the mountain of requests. In any case, journalists with an axe to grind are a formidable bunch, and their reactions to the redacted results were predictably strident. This has had the effect (unintended by the petitioners, at least) of electronically exhuming affairs which the individuals concerned had aimed to consign to digital dust. 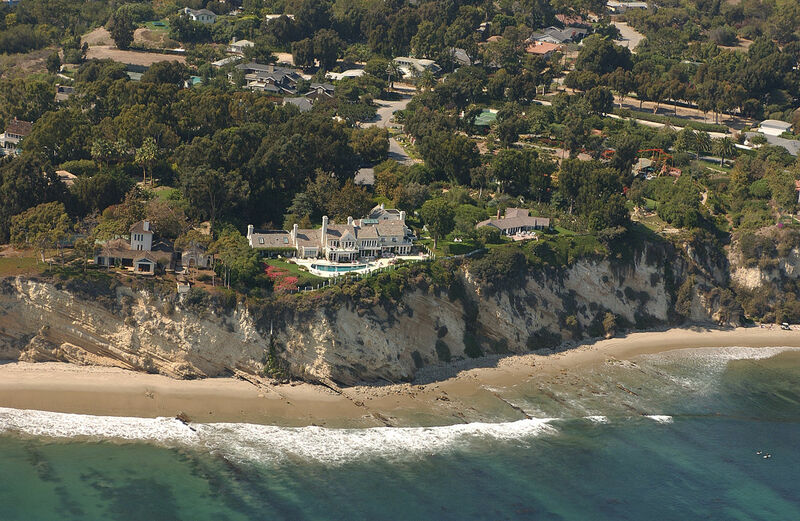 This is a classic example of the Streisand Effect, so-named after the woefully misjudged attempt by representatives of actor Barbara Streisand to suppress a photo of her house in the hills, which generated exponentially more attention to the image than it had garnered previously. Stated another way, not all publicity is good publicity, especially publicity about publicity. 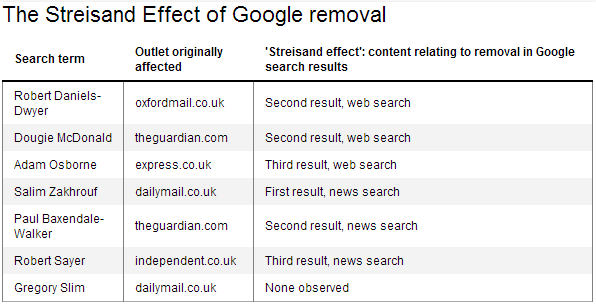 I performed a quick investigation into the extent of the Streisand Effect in the aftermath of the right to be forgotten removals. Using cases listed on the ‘Hidden from Google’ service, which attempts to group all known removals of search results, I identified seven cases where results have been verifiably removed from the google.co.uk results page, and ran fresh Google web and news search queries of the names of the individuals associated. It’s important to note a number of things at this stage. Firstly, Google doesn’t reveal to content producers who made removal requests, so there’s no way of knowing whether the individuals concerned are the ones who made the request (though given the negative publicity originally surrounding most of these cases, it’s a fair working assumption.) Secondly, neither does Google reveal precisely what search terms are affected, so the searches I ran don’t map directly onto these terms. Finally, Google has recently backtracked and reinstated links to many of the stories which were originally removed. With these points in mind, below is a table showing the seven cases and, for each, whether and where content about the removals appear in current Google search results, on the first page of results for either a web search for a news search. In six of the seven cases, there is a ‘Streisand effect’ in evidence, within either the web search or news search results: searching for an individual associated with a removal gives a result which refers to the removal itself, for example an article relating to a football official entitled “Google try to silence Daily Record by hiding article about referee who lied over controversial penalty decision”. Thus the undesirable story which the individual was likely trying to hide reappears on Google anew. Only in the final case does a search return no such reference. Crucially, this is in no way a random or systematic sample of removals: the original seven cases com from the Hidden from Google service, which only includes instances where removal has been verified (and publicised) by the outlet affected. As posited earlier, it is more likely the tip of an iceberg: many removals have probably proceeded un-remarked-upon; the volume of ‘unknown unknowns’ is probably much greater than that of ‘known unknowns’ (or strictly speaking ‘known unseens’.) This analysis only posits the existence of a Streisand effect, not the generalisability of one. Yet the principle Google has established, to notify content producers of removals, nonetheless points a way forward. A ‘removal register’ such as Hidden from Google could offer a place for producers to record Google removals, which would offer greater transparency and, serving the interests of those who oppose the ECJ ruling, solidify the Streisand effect for everyone who tries to be forgotten. One might even foresee a browser extension akin to Memento, to automatically alert users to missing search results. The debate over ECJ and its consequences will run and run, but the observation of the Streisand effect here shows that in the short term at least, attempting to be forgotten might result in even more remembering. Not for the first time, an attempt to regulate the Internet may have turned into a law of unintended consequences. NB: in a (more symbolic than instrumental) attempt at not interfering with the object of research, none of the search terms analysed appear in machine-readable or -indexable text in this article; pages I’ve linked to obviously do. Next Post Social media and public opinion: what’s new?